As you know from reading our daily missives, guesses, and attempts at independent thought, we are big believers in feedback loops, which tend to create self-reinforcing cycles over all time frames (the fractal nature of markets, as it were). To paraphrase Jesse Livermore, the big money is made in the big swing (self-reinforcing long-term trend) and the little money is made in the small swing (self-reinforcing move over the short-term). And as you also know I am also an “equilibrium” denier. Why? Well it is because in actively traded asset markets the raw material of the elusive “equilibrium” is fundamentals. But in the real world fundamental conditions are often as ephemeral as technical conditions. What is left? I think George Soros (the brilliant global macro trader, not the loony political hack version) nailed it when he postulated actively traded asset markets are no more than boom-bust cycles at the core. These booms and busts are created by real people, like you and me, and those chosen few elite who get a sneak peek at the order flow (this group we can call “the house,” which includes for example exchange members, investment bank players, US Congress, Plunge Protection Team, etc.). The sneek-peekers aren’t always right, but it does skew the game in their favor at the margin. We can gnash our teeth about this, and I have, but in the end it is what it is. When we add up all the rationales for a trade or investment (differentiated by time frame in this usage) the bottom line is real money is the mother’s milk of asset price movement. Of course there are literally millions of reasons real people decide to move real money. But remember God and price action is on the side of those with the biggest guns, no matter the reason (s). So, as small traders, our goal should first be to make sure we are playing this game in the right ball park. If we show up in Philly for a game at Fenway we aren’t likely to do too well. And if the Florida Marlins show up anywhere, it really doesn’t matter…uhhhggg, a story for another day. Funds flow emanates from the center and moves out to the periphery when the environment is good. But when the environment turns band, the funds from the periphery flow back to the center (all time frames). Global demand (growth) is a major determinate of whether funds flow outward to the periphery (relatively strong demand) or back to the center (relatively weak demand). The developed world deep capital markets relative to the capital markets in the emerging/developing world markets is why this happens. Funds flowing in a clockwise direction mean this cycle is self-reinforcing and positive; when counterclockwise it means this cycle is self-reinforcing and negative. Emerging markets have been hit pretty hard lately. The catalyst, as believed, is the view central banks (Fed tapering leading the way) will start withdrawing liquidity from the world. That in itself shouldn’t lead to a battering of emerging markets unless there is an expectation that global demand won’t rebound strong enough to lead real people to push money out to the periphery in order to capitalize on markets that tend to grow faster than the industrialized world. 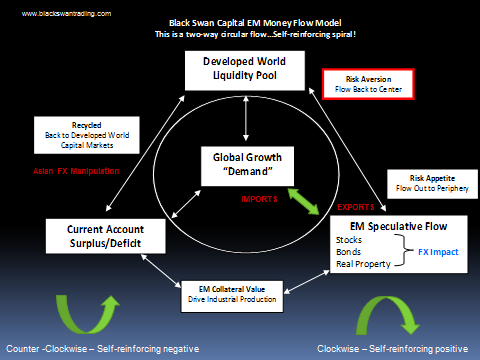 But, if global growth is suspect and central banks reduce liquidity at the margin, this funds flow diagram suggest a counterclockwise flow over some unknown intermediate-term time frame.